Remember that old saying, “Speed costs money; how fast do you want to go?” Although the premise of that thought is basically right, most of us are not endowed with wheelbarrows full of cash and therefore must make “selective” decisions when building an engine. The truth is, engine builds headed for street, street/strip or bracket racing generally don’t require all the latest and greatest top-drawer (read expensive!) components a professional program needs. 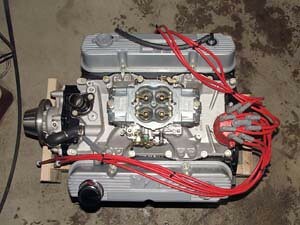 All of the OEM factories (Chrysler, Ford and GM) and a few aftermarket engine companies saw a window of opportunity for a marketable performance engine, aka a “crate engine.” Current OEM crate engines are built from select, readily-available components, which when compiled make a reasonable amount of power per dollar spent. To coin a popular phrase, “If you build it, they will come.” And so they did. Even before the advent of the factory performance “crate engine,” many warehouses and performance builders offered “engine kits.” Again, with pre-selected components formulated to a given performance level, they worked when mixed in with the performance enthusiasts’ existing engine. This particular engine build, the Street/Strip 373, makes well over 415 honest, uncorrected horsepower, has a torque curve as flat as the Great Plains, and can easily be stepped up another 40 to 50 horsepower with simple bolt-on changes at a later date. On the street, the 373 has the torque of a big block and on the track, it revs like a rocket. In plain terms, that flat torque curve means high stall converters and deep rear end gears are not required with drivability an absolute pleasure from an idle to the 5,800 rpm redline. There are two ways to build a Chrysler 370+ cubic inch small block. The most common way would be to start with a scarce heavy-wall 360 of 1970-1972 vintage. There are two drawbacks to using an LA-series 360 base – first, the ’73 and newer 360 blocks get very thin after only .030 inches of overboring. Secondly, the massive 360 Mopar has three-inch main journals which, by design, take a lot of meat off the main caps. The 340-incher incorporates 2½-inch mains, leaving more meat in this critical area for horsepower development. The only drawback on the 340 today is core scarcity. Nonetheless, with the following formula, the best part of the 373 is that a Mopar enthusiast can select and adapt the components listed in this story and build the engine as time and money allow. Not a bad way to go. So, the 373 sounds appealin’ to ya but maybe yer lookin’ for a little more power without givin’ up that Olive Oyl torque curve. No problem; use the same short block we just built in the story and drop on some Hughes Magnum heads with their bigger valves. You can expect a solid 30 to 40 hp gain with just this swap. Want even more? Build a “Saturday Night Special” by having your pistons manufactured with a 10.1 or, 10.5.1 compression ratio for another 10 to 15hp. The 373’s hp is now around the 460/475hp range without even a cam change. Let’s go the other way and say your street rod needs low maintenance but still big power? Use a Holley 600-cfm carb on top of a dual plane MP intake, and slide a 210/215 degree at .050 inch hydraulic cam in the block. You won’t loose much power, but you’ll bring the torque way up. No matter how you slice it, the 373 short-block is a solid foundation for a street, bracket or truck SB Mopar. 1 The 373 Street/Strip engine begins with a 340 block overbored .035 inches to a cylinder bore of 4.075 inches in diameter. The basic block prep includes pressure testing after a hot tank bath, main-saddle align honing, deck resurfacing, and then every thread hole is chased. 2 To begin the block prep, the machine shop grinds and polishes all the sharp edges from the lifter valley and block to reduce stress points, then boils the block. After that, cam bearings and freeze plugs are installed and the block is painted. 3 The 373 utilizes a 1968-1973 340 block because the 340 block begins with a 4.04 inch bore (.040 inches more than a 360) and they bore the block .035 inches to 4.075 inches total. This means more cubes and thicker cylinder walls to handle increased horsepower when compared to the 360. 4 Although the LA is a very stout engine from the factory, when power enhanced, it can develop “main cap dance.” Durable ARP main studs provide the necessary clamping force of the main caps when horsepower rockets; our machine shop prefers ARP studs for all three versions of the 373 stroker engines they build. The next step up in the performance ladder is the Pro-Gram billet steel four-bolt mains and associated mill work, again incorporating ARP main studs. Other APR fasteners compliment the entire engine package. 5 This particular 373 engine was headed for a four-speed A-body. Clevite 77 Tri-Metal bearings are durable enough to maintain the poundings of constant clutch hammerings without softening up and increasing crank thrust clearances. In A727 ’Flite apps, the machine shop recommends Clevite Mico Babbit bearings, since Tri-Metals require more frequent oil and filter changes. 6 The machine shop inspected and magnafluxed an OE 360 cast crank then cut the main journals down to 2½ inches 340 sizes and added a full radius to replace the light duty OE rolled journal fillet. Ready for the 340 journals, it was then surfaced-hardened for durability. Though it is a casting, the crank mods make for a super stout crank for street and bracket package able to handle surprisingly high horsepower increases. 7 Meanwhile, the 373’s rods went through a general high performance reconditioning that includes magnafluxing, peening, and big-end resizing. ARP hardware was again the preferred choice for fasteners. Durable press-fit pins manufactured by Diamond Pistons finish them off. 8 Street fuel can become a real issue for a performance build, especially with today’s M-05, E-10, and E-85 blends. While high compression ratios in LA engines are usually accomplished with domed pistons (in pre-Magnum heads), that design can impede flow from the intake to exhaust seats. The forged, .035 inch-over Diamond Pistons have no dome, and their unique high-swirl dished slugs were just the ticket for a 9.5:1 street/strip engine living on pump gas. Diamond offers all sorts of ring combinations to accommodate any engine build as well as lighter weight racing designs. 9a & 9b A stock 340 oil pan was used for a reservoir for a Melling high volume oil pump, pick-up, and intermediate shaft. The machine shop also radius-polished the rear main cap oil port to aid flow to the crank to complete the lubrication system. The 360’s and 340’s use slightly different windage trays. The machine shop made a few slight clearance “tweaks” to the Milodon 340 windage tray to accommodate the 360 crank. 10 The 373’s take advantage of the 1992-and-up Magnum heads, which have high-swirl, 62cc combustion chambers and maximum velocity ports, and help eliminate the need for domed pistons. The Street 373’s retain stock valves diameters and a Good-Guy bowl job. The Street/Strip 373 (pictured) goes a few steps further using .450 inch longer stem intake valves with two-inch diameters while the exhaust valve diameter of 1.62 remains the same as stock. The Magnum Street/Strip heads are pocket-ported, gasket-matched, and add a little magic in the intake and exhaust port runners. The Street/Strip 373’s also have smaller 61cc combustion chambers and special valve springs and spring seat modifications to accommodate .600 + lift. 11 The valvetrain combo consists of solid lifters encompassing central lubrication holes through the center of the lifter (which supply oil pressure oil to the rocker arms), Comp Cams moly pushrods, and retainers, valve locks, and valve springs. A Comp Cams grind (P/N 20-233-4) incorporates an intake/exhaust duration of 230/236 at .050 inch respectively (268/275 advertised) and valve lift of .521/.536for the 417hp Street/Strip 373. The cam has a nice rumpty-rump tone, makes a ton of torque, and pulls hard to 5,800 rpm. The machine shop selected Crane/Wolverine 1.6 precision needle bearing rocker arms, which can still be found in many aftermarket supply warehouses or swap meets; Hughes Engines also offers identical roller 1.6 rocker arms. 12 A 750 cfm Holley Street/Strip double pump carb (List # 82751) sitting atop a Mopar Performance single plane intake delivered flat line torque through the mid-range without compromising the low or high speed power. Automatic trans cars using a similar cam to this engine’s should opt for a 700 cfm version of the same carb on an MP dual plane intake; the 50 cfm loss aids low speed throttle response and converter flash. The mechanical-secondary Holley features dual accelerator pumps, adjustable air bleeds, contoured venturii inlets for increased airflow, and four corner idle for precise idle control. A tuning DVD is included. The article featured on this page is from the April issue of Mopar Enthusiast Magazine. I have a 360 engine. How can I tell whether or not it is of 70 to 72 vintage?